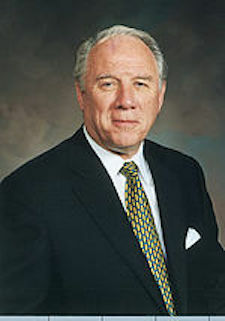 Donald L. Staheli was a former member of the Second Quorum of the Seventy. He was sustained as a General Authority of The Church of Jesus Christ of Latter-day Saints on April 5, 1997, and served in that quorum until September 30, 2006. He was president of the Yorktown New York Stake at the time of his call. He was born on October 19, 1931, in St. George, Utah, and was raised in nearby Hurricane. He earned his bachelor’s degree from Utah State University and his master’s and PhD degrees from the University of Illinois. Staheli was the CEO of Allied Mills and then CEO of Continental Grain and chair of the US-China Business Council. He was a director of the National Committee on US-China Relations and the US-China Society. He served as an international business advisor to the mayor of Shanghai, Zhu Rongji. he was also chairman of the Points of Light Foundation, a national organization that encourages volunteer activities. He passed away on May 29, 2010. He and his wife, Afton, were serving as president and matron of the Draper Utah Temple at the time of his passing. They were the first couple called to preside over the temple. They had four children. Staheli also served two years in the US Air Force.